Coming up on Tuesday is the 14th anniversary of Disney & Pixar’s Finding Nemo. With it also being Memorial Day weekend, and picnic weekend on Disney Family, I thought it would be perfect to combine all three of those inspirations and have a Finding Nemo beach picnic with my family! 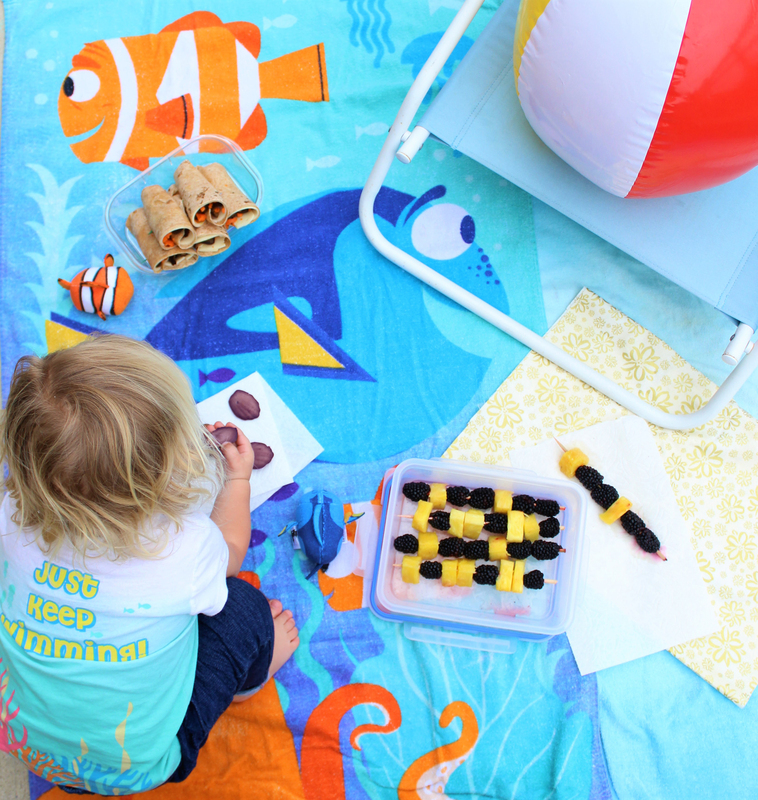 For the beach picnic, we brought a Nemo & Dory beach towel, as well as our blue beach chairs. We brought a colorful beach ball for some fun in the sun, and of course delicious food! To drink, we had sparkling star water, and to eat had Nemo sandwich wraps, Dory-inspired fruit skewers on the side, and blackberry mandeleine cookies for desert, to look like purple shells (a little nod to Finding Dory). These sandwich wraps are whole wheat tortillas with provolone cheese, shredded carrots, diced olives, and vegan chipotle mayo to have a wrap that was orange, white, and black – just like the colors of a clown fish! These fruit skewers are made with blackberries and pineapple slices. You can also use blueberries, if you prefer the taste of those! I like a tarter berry, myself. The Sparkling Star Water is Sprindrift sparkling lemon water (Spindrift is naturally flavored carbonated water), topped with a star-shaped watermelon to look like Peach. I love the soft texture of mandeleine cookies, so thought it would be fun to incorporate them into the Finding Nemo picnic since they look like shells! I made blackberry mandeleines to look like purple shells, just like in Finding Dory! The recipe is available to view and print at the bottom of the post! I hope these ideas and recipes inspire you to have your own Disney family fun this Memorial Day weekend! Whisk the eggs and melted coconut oill together. Add in the rest of the ingredients, combine well. Spray mandeleine tray with coconut oil, and place batter in each of the molds.